Few breakthroughs in battling cancer have generated more excitement recently than immunotherapy. It’s helping some patients—including high profile ones like former president Jimmy Carter—achieve long-term remission and possibly even a cure when their cancer might have otherwise been deadly. But how does immunotherapy work? And could it possibly help you or someone you love? Here are answers to some common questions about this promising way of treating cancer. Q: What exactly is immunotherapy? A: Simply put, “immunotherapy is a type of treatment that uses the body’s own immune system to recognize, attack and kill cancer cells,” said Matthew Zibelman, MD, a medical oncologist at Fox Chase Cancer Center. Q: What are its advantages? A: Many conventional cancer treatments—such as chemotherapy—can eventually stop working because cancer cells develop a resistance to them. “But when patients have a good response to immunotherapy, that response can sometimes last for years in cancers that were once virtually untreatable,” Dr. Zibelman said. Two prime examples are advanced melanoma and non-small cell lung cancer. Q: Are there different kinds of immunotherapy? A: Yes—and the most common kind being used today are drugs called checkpoint inhibitors. Given by IV, “they disrupt signals that allow cancer cells to hide from the immune system,” Dr. Zibelman explained. That frees the immune system to recognize and destroy cancer cells. Doctors use checkpoint inhibitors to treat many different cancers, typically those that have metastasized. Among them: melanoma, non-small cell lung cancer, kidney cancer, bladder cancer, Hodgkin's lymphoma, and some head and neck cancers. Roughly 20 to 40 percent of patients are helped by these drugs. But combining two checkpoint inhibitors may sometimes boost their power, Dr. Zibelman said. CAR T-cell therapy. Here, doctors extract Tcells from a patient’s blood and alter them genetically, training them to specifically target the cancer cells in question. Next, doctors multiply the cells in a lab and return them back into the patient using an IV. Approved in 2017, this approach shows great promise treating certain hard-to-treat leukemias and lymphomas. Vaccines. Unlike typical vaccines that prevent diseases, cancer treatment vaccines are designed to get the immune system to attack a disease that already exists. As of 2017, only one vaccine is approved in the U.S. to treat cancer, but many are currently being studied. The FDA-approved cancer vaccine is used for advanced prostate cancer that is no longer responding to hormone therapy alone. It’s similar to CAR T-cell therapy in that immune cells are removed from the body, enhanced and then returned. This has been shown to help men live several months longer. Oncolytic viruses. 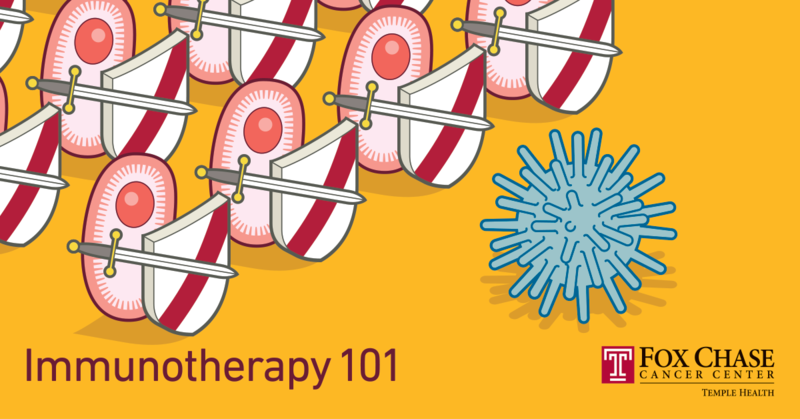 For this therapy, viruses are modified in the lab so they can infect and destroy cancer cells. Doctors inject a modified virus directly into a melanoma tumor that can’t be cut away. The virus multiplies, causing cancer cells to rupture and die. “Once the cells explode, antibodies are released that also help mount an immune response,” Dr. Zibelman said. Q: What are possible side effects of immunotherapy? Q: Is it beneficial to be treated with immunotherapy at a specialized cancer center? A: Very often, yes. “Oncologists at specialized centers like Fox Chase are very familiar with how these drugs work and how to best manage their potential side effects,” Dr. Zibelman said. You’ll also have greater access to clinical trials testing new advances in immunotherapy. Learn more about Immunotherapy at Fox Chase Cancer Center. Offering next business day appointments. Ovarian Cancer: Do You Know the Signs and Symptoms? The Battle Against Lung Cancer Has a New Weapon: Immunotherapy. What Is a Magnet®-Designated Hospital—And Why Should It Matter To You? What is Tumor Profiling and How Can it Help Me?